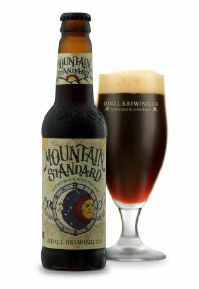 [PRESS RELEASE] Fort Collins, CO. – On September 22, 2012, fall officially returns as does Odell Brewing Company’s Mountain Standard. The brew, a double black IPA, was released in a four-pack for the first time last year. Featuring hops grown on Colorado’s western slope, the brew blends a rich, dark malt character with a crisp and bright hop aroma and flavor. The bold combination pairs well with brined or roasted meats, sharp aged cheddars, or bittersweet chocolate. 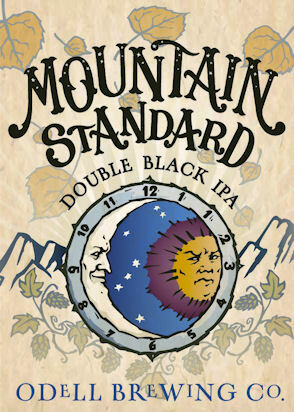 The brewery will celebrate the return of Mountain Standard in the Tap Room on September 22nd, during the Fall Equinox. Guests can try the beer, and enjoy local food truck fare as well as live music by The Constant Tourists from 4 – 6 p.m.
Mountain Standard is available from September - January within the brewery’s ten state distribution footprint. Fermentedly Challenged's comments: This beer is being released much earlier than last year. In 2011, the beer debuted on November 5th. This year, they didn't want to wait for this returning favorite to be released. This beer is not to be confused with their 2009 Mountain Standard Reserve. That was a hoppy brown ale and was only released once. - Odell Brewing releases The Meddler Oud Bruin.